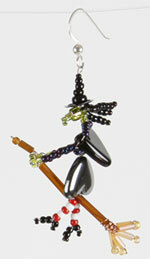 Beadwitched Earrings at Quilt Visions Art Quilt Gallery | Stabbed! My witch earrings and pendants can be purchased at Quilt Visions Art Quilt Gallery in San Diego. For information enquire at visions@quiltvisions.org or 619-546-4872. If you incline toward the tactile, you’ll enjoy viewing their web site. Be sure to visit on your next trip to San Diego. 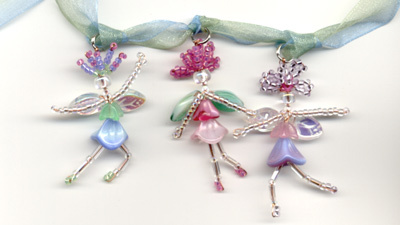 My fairy jewelry-making kits are also available in the Gallery Shop. They come in three styles: original pastel, woodland colors and a slightly larger fairy with vintage repro flower and leaf beads. If you’re interested in making your own witches, see this post. This entry was posted on October 7, 2008 at 10:03 pm and is filed under Bead Art, Uncategorized. You can follow any responses to this entry through the RSS 2.0 feed. You can leave a response, or trackback from your own site.